Because the product contains bilberry fruit extract and antioxidant vitamins: C and E, it supports retina. We recommend it to anyone whose retina has been damaged, for example when you have diabetes or hypertension, as well as to anyone working on a computer or in bad lighting, anyone having trouble seeing at night, and to seniors. Reducing oxidative stress helps prevent the cataract development. 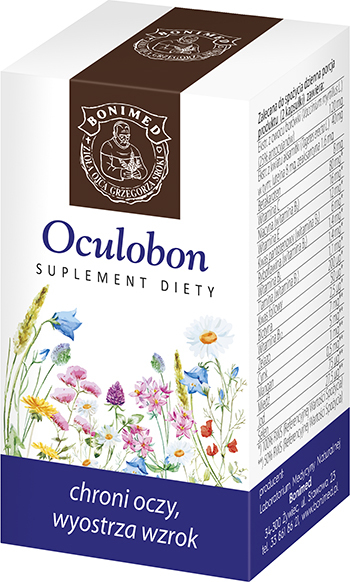 Because it consists of marigold extract which contains lutein and zeaxanthin, Oculobon protects the macula of retina, especially in case of age-related macular degeneration (AMD). Ingredients: Vitamin premix, gelatin (coating), bilberry fruit extract, mineral premix, marigold flower extract, beta-carotene, bulking agent (maltodextrin, corn starch), antioxidants (tocopherol, ascorbyl palmitate), carriers (gelatin, coconut oil, sucrose), anti-caking agent (silicon dioxide). Recommended daily intake of the product (2 capsules) contains: Bilberry fruit extract (vaccinium myrtilus) (25% of anthocyanins) 120 mg, lutein from marigold flower 8 mg, beta-carotene 8 mg, zeaxanthin from marigold flower 1.6 mg, vit.E (dl-alpha-tocopheryl acetate) 12 mg*, vit. C (L-ascorbic acid) 80 mg*, vit. B1 (thiamine mononitrate) 1.1 mg*, vit. B2 (riboflavin) 1.4mg*, vit. B3 (nicotinamide) 16 mg, vit. B5 (d-calcium pantothenate) 6 mg, vit. B6 (pyridoxine hydrochloride) 1.4 mg*, vit. B12 (cyanocobalamin) 2.5 µg*, folic acid (pteroyl-L-glutamic acid) 200 µg *, vit. H (d-biotin) 50 µg* , zinc (zinc sulphate)5 mg**, copper (copper(II) sulfate) 0.5 mg**, iodine (potassium iodide) 75 µg**, iron (iron(II) lactate) 7 mg**, manganese (manganese sulfate)1 mg**, selenium (sodium(IV) selenate) 27.5 µg**. Recommended intake: Take 1 capsule 2 times per day. Dietary supplements should not be treated as a substitute (replacement) of a varied diet. Do not exceed recommended daily intake during the day. Storage: Store in a closed package in temperature lower than 25°C, in a dry place. Protect from sunlight. Keep out of reach of children. Caution: Don’t use it if you are allergic to the product ingredients. A healthy lifestyle, including a balanced diet is the best way to maintain good health. Information provided on this website is only educational, it cannot replace professional medical advice. Health condition and any abnormalities should be consulted with relevant medical services. Before taking any action related to the treatment we advise you to tell your doctor about it. “Before use, read the leaflet in the package or consult with your doctor or pharmacist, as each drug used improperly threatens your life or health”. Zgodnie z Rozporządzeniem Parlamentu Europejskiego i Rady (UE) 2016/679 z dnia 27 kwietnia 2016 r. w sprawie ochrony danych osób fizycznych w związku z przetwarzaniem danych osobowych i w sprawie swobodnego przepływu takich danych oraz uchylenia dyrektywy 95/46/WE (zwane „RODO”) informujemy, że Administratorem danych osobowych jest Laboratorium Medycyny Naturalnej BONIMED, 34-300 Żywiec, ul. Stawowa 23. Szczególe informacje na temat ochrony danych osobowych znajdują się w Regulaminie sklepu. Information provided on this website is only educational, it cannot replace professional medical advice. Health condition and any abnormalities should be consulted with relevant medical services. Before taking any action related to the treatment we advise you to tell your doctor about it. "Before use, read the leaflet in the package or consult with your doctor or pharmacist, as each drug used improperly threatens your life or health".